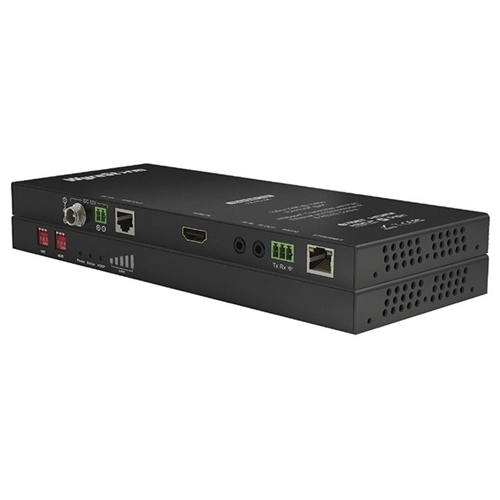 UltraHD, Ultra slim point-to-point HDMI extender set supporting 4K video up to 70m/230ft and 100m/328ft HDBaseT 5-Play compliance featuring 1080p/48bit @ 60hz, HD audio, bidirectional control via IR and RS232, two-way PoH remote power of devices power and Ethernet passthrough, all wrapped up in an impossibly thin chassis for an ease of installation that represents unrivalled function, flexibility and reliability for residential or commercial applications of any kind. Pushing technology and design to the limit, the EX-70-4K extender set supports 4K HDBaseT distribution and control within an incredibly low profile chassis of just 18mm for a greatly reduced form factor behind even the slimmest TV mounts to make installation a dream. Featuring powerful Class A HDBaseT technology, the EX-70-4K supports the full 5Play feature set including 100m/328ft transmissions of 1080p@60Hz with 48bit Deep Color, HD multichannel audio, discrete bi-directional control via IR and RS232, Ethernet pass-through - all along a single Cat5e/6 cable to display zones. UltraHD 4K transmissions up to 4096 x 2160 are supported to 70m/230ft over Cat5e/6 at 30fps with 4K full chroma sub-sampling color palette of 4K@30Hz 4:4:4 and 4K@60Hz 4:2:0, with greater distances possible using higher cable specification. Automatic internal HDCP and manual EDID management negotiate communication between connected source/display devices for enhanced compatibility between source/display devices and operation status of the units is illustrated by panel LED indicators for power supply, signal status for display connection, HDCP in signal, and 5-level signal indication to visually illustrate transmission strength assess and help identify potential issues. Including serial control support with compatibility with leading control systems and switchable RS232 selection for firmware updates, improved 12v power connectivity is also offered via threaded DC power port for standard and locking DC power plugs on both transmitter and receiver, should it be required. WyreStorm 4K HDBaseT solutions offer the features, flexibility and compatibility demanded by modern integrations while future-proofing for tomorrow, combined with an ease of use and cost-efficiency for reliable distribution and control of digital content over distance whether in a residential or commercial setting. Supports all high definition resolutions: 4K (UHD & DCI), 1080p, 1080i, 720p with screen refresh rate support of 24Hz, 30Hz (4K) 50Hz, 60Hz (1080p), 4K@60Hz YUV4:2:0 –CHECK is firmware update required? Dimensions (WxHxD): 232mm x 18mm x 93.30mm/ 9.13" x 0.71" x 3.67"